The first batch of Apple Watch apps were pretty underwhelming, but some diamonds are starting to emerge from the rough. 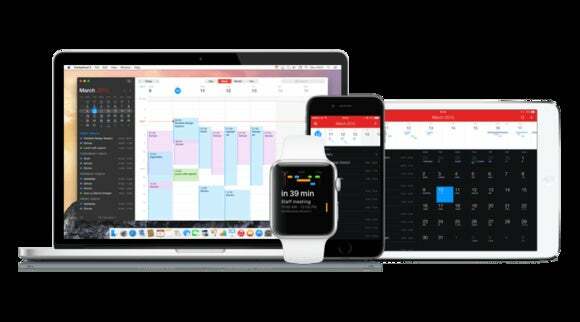 Fantastical 2 for iPhone got an update Wednesday to version 2.3, including the natural language calendar’s companion app for Apple Watch. Updating to version 2.3 adds the Apple Watch app—you have to add the app, and optionally its Glance, to your Watch with the Apple Watch app for the iPhone. But then you also have to launch Fantastical 2 on the iPhone, tap the gear icon in the upper-left, and look for the new Apple Watch settings. From here, you can choose to show maps of your events’ locations, whether you tapping the Glance to open your next appointment in the Apple Watch app or your whole list, and other small tweaks. My favorite thing about Fantastical 2 on the Apple Watch is that you can add new appointments right from your wrist. Apple’s built-in Calendar app only lets you view appointments, not make new ones, although you can always hold down the Digital Crown and add new items to your calendar with Siri. Fantastical also uses Siri to get this done in-app. Force-touch the screen in the Fantastical app to get the Add Event button. Tapping that will bring up a Siri screen, and you just speak your next appointment. 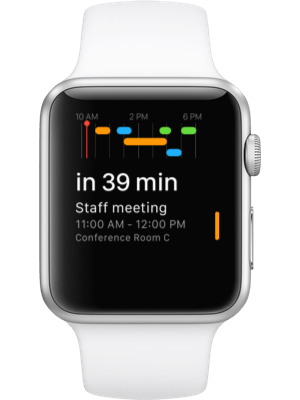 Fantastical 2 lets you add events from your Apple Watch, and it parses words like "lunch" into exact times, which Apple's Calendar app can't do. The app will parse your spoken phrase into an appointment—sometimes it wouldn’t work until I pressed Done at the top-right of the Siri screen. In my tests, it worked pretty well, but if it gets something wrong, there’s no way to really edit it. Using Siri to add things to Apple’s own Calendar app is a little more robust, but also more finicky. The Calendar app can’t parse generic items like “lunch” or “dinner,” so Siri will insist you give an exact time, while Fantastical’s engine will automatically schedule lunches for noon and dinners for 6pm. Using Siri to make Calendar events will also check for conflicts, while Fantastical didn’t notify me of a conflict when I added a coffee date at the same time as the WWDC keynote. But Calendar’s conflict reminders can actually be annoying when the conflict is an all-day event like someone’s birthday. Worse, the screen that mentions the conflict doesn’t want to tell me what the conflict actually is. So I don’t miss that functionality in Fantastical 2 quite so much, but it’d be a nice thing to add. I’d also love it if Fantastical would offer to send invites to the people I mention in my appointments. 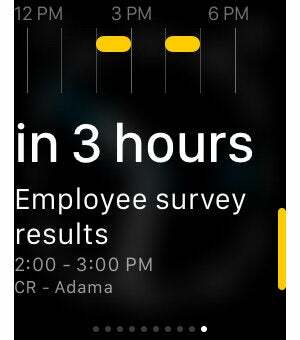 The Glance looks great—I love how it shows you how much time until your next appointment. Fantastical 2’s Glance can show your next appointment or a list of everything you’ve got on tap that day. (You toggle between them in the Apple Watch settings in Fantastical for the iPhone, or turn the Glance on and off in the Apple Watch app for iPhone.) I love how the Glance shows a little graphical timeline of your day with your appointments blocked off and color-coded to match your calendars. This can be handy to see where your free chunks of time are, and figuring out you better get lunch now because your afternoon doesn’t have any open blocks of time. Fantastical 2 for iPhone is $5—Dan Frakes gave it 4.5 mice upon its release in late 2013, and it’s only gotten better since.